In 1982, following the withdrawal of the MS Dwarka from Persian Gulf service, the SS Uganda became the final ship with the once well-known B.I. funnel colours. Her oversized funnel was literally her crowning glory, and many passengers and crew became proud of it. The appearance of the funnel remained almost unchanged during the ship's 34 years with the exception of a brief period during and immediately after the Falklands War. Source: Courtesy of Peter Kohler. 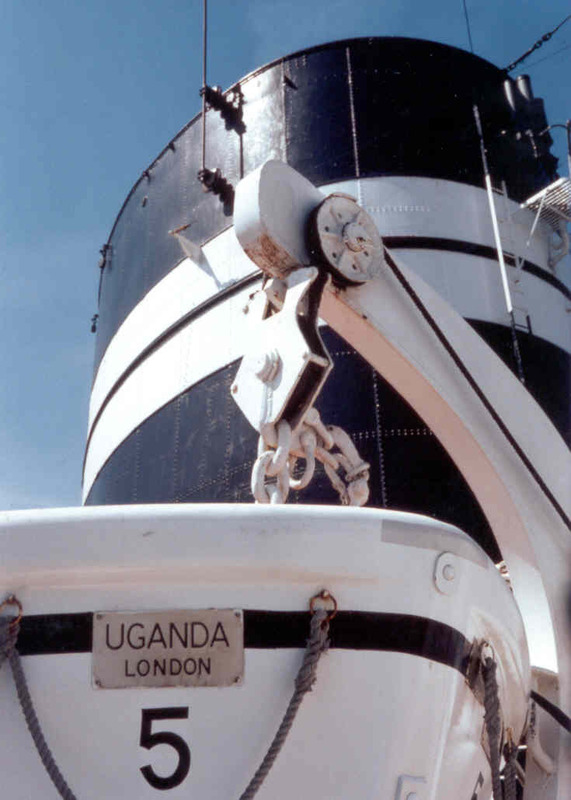 The SS Uganda was built for the British India Steam Navigation Company Ltd. as a relatively ordinary passenger-cargo liner to serve on their UK-East Africa service. However, she went on to experience an exceptional career as an educational cruise ship, a hospital ship during the Falklands War and, finally, a troopship serving the Falklands while Mount Pleasant Airport was under construction. The SS Uganda Trust, which has a close association with the former liner and the people associated with her, was created to advance public education in maritime history and to provide educational and recreational facilities for children and young people. This web site contains further information about the SS Uganda, the activities of Trust, and how to order your copy of the book NEVASA British India Centenary Ship which was written by the Trust. The SS Uganda had a number of 60th anniversaries in 2012, having been launched on the 15th January 1952 and commenced trials after six months of fitting out on the 15th July. Just two weeks later she set off on her maiden voyage from Tilbury on the 2nd August, entered the Suez Canal for the first time on the 10th August and arrived at her main East African port, Mombasa on the 19th August. 2012 was also the 30th anniversary of the Falklands War where the veteran liner and her crew gave exemplary service in the treatement of over 700 British and Argentinian casualities. There was an event to celebrate this anniversay of the SS Uganda, aimed primarily at former crew, held as part of the BI Reunion at Southampton in October 2012.